James A. Mousalimas was elected to the office of County Superintendent of Schools on November 4, 2014 and began his term on January 5, 2015. 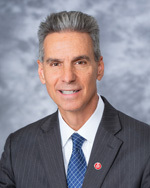 Mousalimas served as Deputy Superintendent of Student Programs and Services with the San Joaquin County Office of Education from March 2013 to December 2014. In this role, he oversaw Educational Services, County Operated Schools and Programs, and Special Education. Prior to becoming Deputy Superintendent, he was the Assistant Superintendent of County Operated Schools and Programs at SJCOE from 2008 to 2013. As Assistant Superintendent, Mousalimas directed Court and Community Schools, Greater Valley Conservation Corps, Outdoor Education, Foster and Homeless Youth Services, Adult Education in County Jail, WorkStartYES*, YouthBuild San Joaquin, and Greater Valley Conservation Corps. During this time, he directed the opening of two charter schools that serve at-risk youth: San Joaquin Building Futures Academy (SJBFA) and one.Charter – Academy for Visual and Performing Arts. SJBFA collaborates with YouthBuild San Joaquin to prepare students, 16-24 year olds who do not have a high school diploma or GED, for a career in the building and construction trades. one.Charter – Academy for Visual and Performing Arts provides at-risk students in grades 7-12 with an education and instruction in the arts. Preceding this position, Mousalimas served as Assistant Superintendent of Human Resources at Tracy Unified School District. His education career began as a Peace Corps Volunteer High School teacher and basketball coach in Niger, West Africa. Following this experience he taught math in Richmond Unified School District. For the next eight years, Mousalimas was a teacher, assistant principal, and principal of an American International School in Saudi Arabia. He returned to the United States in 1998 and served as Coordinator of Year-Round Education before becoming the Director of Alternative Programs for Tracy Unified School District in 2001. Mousalimas received his Administrative Services Credential from California State University, Stanislaus; he earned his Bachelor of Arts in economics from University of California, Berkeley, and his Master of Education from the College of New Jersey.